Union Berlin celebrating their first goal of the night. Sebastian Andersson and Akaki Gogia score for the visitors, who hang on despite a late consolation from Stefan Kutschke. 1. FC Union Berlin returned to the 2. Bundesliga top two with a comfortable 2-1 victory over FC Ingolstadt 04. Sebastian Andersson put them ahead from the spot late in the first half, with Akaki Gogia adding a deserved second. Stefan Kutschke pulled one back with a penalty, but Die Schanzer remain in the relegation zone. 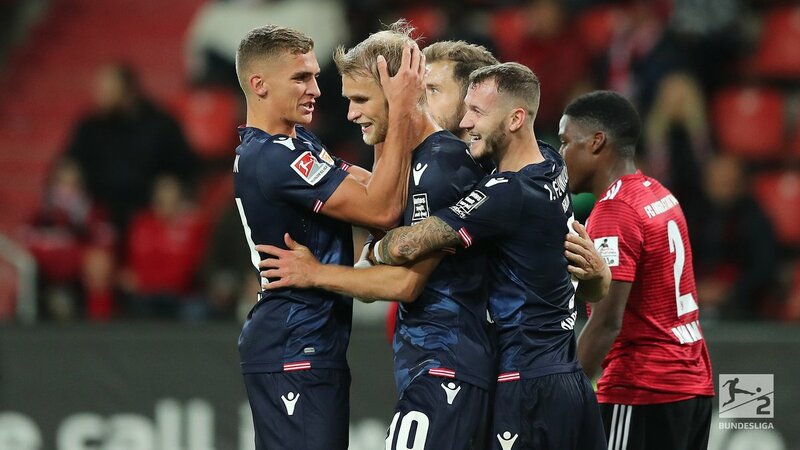 The first half was a tale of Union dominance, as they piled on the pressure on their hosts, with plenty of set pieces causing Ingolstadt problems. Andersson had the first notable chance, shooting wide across Marco Knaller’s goal. The Ingolstadt goalkeeper reacted well to a Marcel Hartel chance, whilst Marvin Friedrich was left unmarked to head over one of many corners in the opening exchanges. The dominance continued, with Ken Reichel and Andersson both having further shots saved, which may have left Urs Fischer frustrated at not breaking the deadlock. Ingolstadt, in their second game under Alexander Nouri, struggled to make a game of it, although they did improve as the half wore on, without testing Rafal Gikiewicz. Shortly before half-time, Union won a penalty in slightly contentious fashion, as Dario Lazcano held back Florian Hübner, enough for Bastian Dankert to point to the spot. Andersson was lucky with his penalty, which went right under Knaller, but it was a goal all the same. Ingolstadt brought on Osayamen Osawe for Lezcano for the start of the second half and tried to find a way back into the game, but still they couldn’t create any chances. The visitors were more subdued, but had a great chance for a second with Gogia’s cross-shot from the right-hand side, which Andersson couldn’t quite turn in at the far post. They could easily have had more but eventually die Eisern did get their second. Thorsten Röcher gave the ball away to Kutschke, Marvin Matip made a mess of attempting to clear the ball as he came towards the box and Gogia made the most of the chance to slot past Knaller. Konstantin Kerschbaumer eventually registered Ingolstadt’s first shot on target of the game on 75 minutes, and soon after they managed to get a goal back from the spot. Christopher Trimmel pushes Röcher, no less a penalty than the one in the first half, and substitute Kutschke converted with more aplomb than Andersson had, sending Gikiewicz the wrong way. Ingolstadt had 15 minutes, including stoppage time, to grab what would have been a largely undeserved point, but despite having most of the ball in that time they couldn’t find it, and fell to a defeat that leaves them second bottom, whilst Union Berlin return to second top. Ingolstadt had performed credibly in their 2-1 defeat to leaders 1. FC Köln on Tuesday night, a game in which Sonny Kittel had given the lead, but it was clear here that they haven’t come to terms yet with the 3-4-1-2 that Nouri has tried to put in place since taking over just before that game and the former Werder Bremen coach has problems to solve at both ends of the pitch if he is to get them moving up the table. The back three looked completely unorganised, with Union’s left-sided players Reichel and Hartel having great fun in pulling Frederic Ananou, the right-sided centre-back, out of position, exposing the rest of the back three. Matip is supposed to be the experience one yet even he was capable for the second goal, whilst the penalty conceded by Lezcano was the fourth they have given away this season. Up front, there weren’t much better, with Nouri yet to find a solution to their failure to capture Andreas Voglsammer to lead the attack during the summer transfer window. Lezcano continues to prove an ineffectual forward, whilst his partner Charlison Benschop was a liability in possession and wayward in his finishing. Both were off by halfway through the second half. They were not helped by some poor deliveries into the box, though. Fischer’s side were not at their best here but they didn’t need to be. On another night, they could have had four or five, such a mess as Ingolstadt were in the first half. Their coach may be disappointed after their lack of ruthlessness and failure to keep a clean sheet, but they still got the job done. They’re back up to second as a result, three points behind Köln, and they remain the only unbeaten team in the league. At the moment they looked well placed for a promotion challenge, although they will have to come through a tough run of games after the international break before we can be completely sure of their credentials. Hartel was the visitors’ most dangerous player in the first half, although he faded as the game wore on. With Ingolstadt struggling to pose a threat on the wings, Trimmel and Reichel had the freedom to throw themselves into the attack. Newcastle United v Southampton Preview: Can the Saints pull themselves closer to safety?